Why did I become a scientist? Well, well, I guess we left the roaring forties only to be thrown into the screeching fifties. The first storm was just a mild blow compared to what we have just gone through. Over the last day and half, we have through a heck of a storm. While the first little tempest gave us 15-foot waves, this last one gave us storm force 60 knot winds and 35 foot monster white caps that would rise higher than the bow of the ship. Of course, before the waves got too large, I had to walk up to bow between the largest waves and rode the ship similar to like in Titanic (without going into the little perch of course!!). It is up here that the noises from the ship and of humanity all but disappear and one can only hear the sound of nature in all of her power and glory. Being all the way at the front of the ship allowed me for a moment become completely enveloped by the scene all around me. It was like as if I was standing on perch gliding above the sea, peering out watching an outrageous scene laid out before me. As I gazed out onto the Southern Ocean, the sea was transformed into a raging angry landscape that without wings or fins, one would perish within moments. Winds that nearly blew me over more than once, thrusted up the seas into twisting mounds of water, shearing off the tops of the waves. These mountains of water rushing toward the ship formed from forces literally from thin air in motion, would rise higher than the bow and indeed sometimes looked like their frothing white tops were nearly as high as the bridge deck. These formed the topography for these furious seas that most violently beat against the hull of this ship. Resting up on the very front of the bow, I can only see, hear, and feel this wondrous reality of this vast violent ocean in front of me. I truly felt like I was gliding above the waves without the huge metallic monstrosity behind me. Just like in the movie, Titanic, I could become enveloped by Mother Nature’s beauty. It is clearly the most magical part of the ship for me. However, with time the waves got so large and the winds so fierce I retreated further back from the front. From there, I was able to continue to watch nature’s fury from a safe, relatively comfortable place. The Captain also made the decision to stop heading south (toward the storm) and slowed the ship to the point it was barely moving. 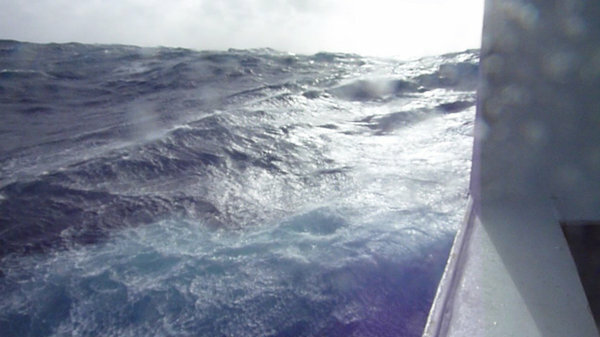 We actually started to go in a west or even northwest direction as to steer the ship directly into the waves as when we tried to go south, the waves would broad side us. The result was that things that were even tied down with bungee cords started falling and sliding. The sound of crashing glass and such in the labs caused some alarm, as these waves were not completely expected as the storm was forecast to have started to die down today and there are a lot of expensive equipment and chemicals there. Within the ship, while the hull is thick, the fury of nature outside was able to penetrate in a manner of fashion. The most obvious was when the ship would rise up during one of the larger waves and then crash down into the sea, which would create a loud thumping sound like the ship was actually smacking down on the water, almost like the ship doing a belly flop on the sea. The other was that as the waves would crash against the bow, it would often lift up the anchor away from the ship, only have it crash against the hull, with a huge CLANG. My berth is fairly close to the anchor and so there were times that I was lying there trying to sleep and be jarred suddenly awake by the loud impact. I am doing good here as I had a little adventure. I had to get a chance to take a closer look at the waves. Do not worry, I watched for some time before venturing onto the main deck to see the status of the waves. The result was amazing and awe inspiring. Mighty waves towering higher than the bow would race toward us with foaming white caps being sheared off by the storm force winds rise the ship up at the last moment and explode like glass into a wall of water and spray that engulf the front of the bow. I may be adventurous, but I am also a careful and so stood back, with the only threat to me was the river of water come rushing down from the bow down the gangway like a little tsunami (mind you it was only about 6 inches high). But definitely high enough to make me jump up to higher ground.